TONG Weidong, violin professor and master tutor with Central Conservatory of Music, Deputy Chief of Orchestra Department of Central Conservatory of Music, Vice Chairman and Secretary General of Violin Society of Chinese Musician Association and member of Chamber Music Society of Chinese Musician Association, Secretary General of the Organization Committee for Qingdao International Violin Competition sponsored by the Ministry of Culture of China, Music and Art Director for 2012 Menuhin International Violin Competition of Beijing Central Conservatory of Music, and Chairman of the Judging Panel for 2013 Hong Kong International Violin Competition. 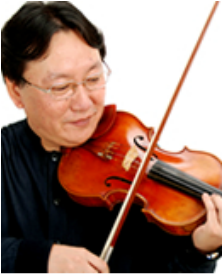 He studied violin from Wang Shanxiu, Hu Weimin, Sui Keqiang, Professor Lin Yaoji and Professor jorg-wolfgang jahn. His major achievements are as follows: Prize winner in the 2nd China Youths Violin Competition (1984), was awarded DAAD Foundation Scholarship in 1996 and dispatched by the National Education Commission to study in Germany by government sponsorship, was awarded master degree in 1998, the 2nd Prize for Beijing City Education Achievements (High Education) in 2008, and won 2009 Baogang Excellent Teacher Award.